At first glance it might appear that Moon is attempting to cross-breed 2001: A Space Odyssey with any number of the space marine movies and video games that have surfaced since the late 1960’s. It soon becomes apparent that Moon is attempting to break new ground, or at least forge a path of its own. The setup is fairly simple; the earth now relies on a single source of clean fuel: Helium-3, which is harvested from moon rocks on the dark side of the moon. They have been soaking up solar energy for millennia and it is now cost-effective to harvest it and send the fuel back to Earth. There is an isolated outpost established, with an operating crew of one. A three year contract binds him to the desolate landscape before he can return home to his family. Sam Bell (Sam Rockwell) misses his wife, Tess (Dominique McElligott), and his young daughter. But he is excited knowing only two weeks remain on his long-term contract. Soon he will be back home on earth with his family and a normal life. At this point it becomes significantly more difficult to discuss the story without revealing interesting elements of the plot. Here is where I strongly encourage you to watch the film without proceeding with this review; the sparse two-paragraph summary will be sufficient, as it is preferable to watch the film knowing little about it. Spoilers may follow. As his epic shift nears an end he starts to fear that he is seeing things. A woman appears in a chair, causing him to scald himself with hot water. The sinister master robot, a complex of arms floating on overhead rails named GERTY (Kevin Spacey), is worried about him. But Sam is afraid that he won’t be able to work out the rest of his shift and covers up both his visions and the cause of his injury. Not long after this incident Sam treks out to investigate a stalled harvester. He has another vision and crashes his rover, miraculously waking up back in the base’s infirmary. But things aren’t quite the same. He catches GERTY covering up a live call from Earth, something he had been told was impossible due to a downed satellite. He becomes more concerned when GERTY asserts that he is not allowed outside and that he must remain in bed for some days. Things become more complicated when he manages to sneak out and find the crashed rover. Inside he finds an injured but conscious Sam Bell. The first half of the film manages to build the mystery surrounding the doppelgangers, but even when the explanation is revealed there is much to anticipate. This is one of the rare occasions where more questions are raised as some are answered, keeping the mystery alive and the audience engaged. Too many films feed explanations (this is one of the reasons I am a David Lynch fan). I wouldn’t say that the plot takes ridiculous twists and turns; much of it may be predicted after the initial reveal, but each new revelation feels natural for the story. There is no disjointed moment that creates a disconnect with the plot or character. Sam Rockwell is forced to carry the picture and he does an admirable job. Not only must he play a possibly crazy man, but he must adopt a different personality for the second Sam that is discovered. Rockwell is just the first piece in a handsome production. First-time writer and director Duncan Jones manages to craft the film simply and gently; there are no camera tricks (outside of the necessary shots of two Sams) and the film enjoys lingering on shots. This gives the entire movie a calm peace, contrasting with the turmoil in the Sam’s minds but paralleling the desolate isolation of the moon base. Some of the more frenetic scenes are suitably edited, and this too is fitting. I love the way Moon gently unfolds its secrets, raising ethical and moral questions without making any of them obvious. The mystery/thriller is told effectively and engagingly, but the underlying questions are what give the film its sustenance. The debates are quiet, but a viewer may find him- or herself asking about the acceptable costs for clean fuel. The science fiction staple, that of asking what makes people people, what gives humanity its spark and essence, is presented subtly, without preaching or pronouncement. Best of all, this is one of the few films that contains a sympathetic robot who manages to find redemption in an empathetic and credible fashion. The film may be similar, in a few ways, to Pandorum [review here], but with Moon it is a travesty that the film was passed over in all Oscar categories; it is better than at least half of the Best Picture nominees, its special effects are remarkably effective at drawing the audience into the story without being flashy, and Sam Rockwell is wonderful. Clint Mansell’s score keeps quiet until it is needed, at which point his characteristic strings and piano hit the right emotional cords. 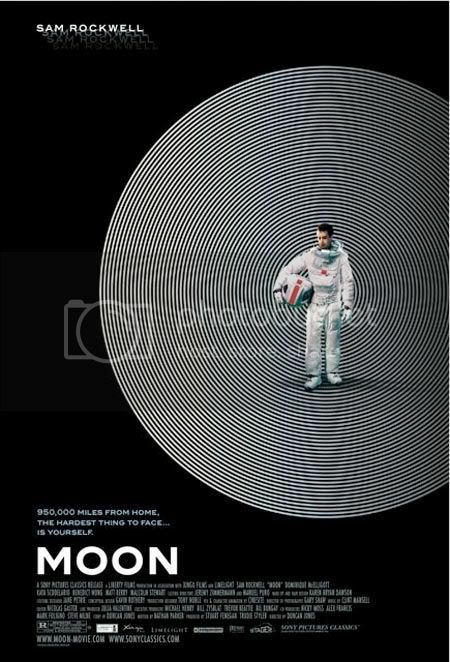 I would strongly encourage all science fiction fans and lovers of thought-provoking and entertaining films to seek out Moon. This entry was posted in 3 pirate flags, 3.5 stars, M, Movie Reviews, Pirate Flag Rating, Star Rating on March 22, 2010 by Tim Irwin.